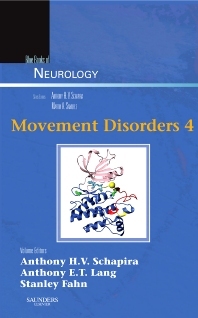 Movement Disorders 4, the newest volume in the Blue Books in Neurology series provides you with rapid access to practical, clinical guidance on the diagnosis and pharmacologic treatment on the full range of movement disorders. Emphasizes the vast array of pharmacologic therapeutics, backed by clinical trials of the past 15 years to help you determine the best and most up-to-date drug therapy. Provides the latest on hot topics such as frontotemporal dementia and Tourette’s and related disorders, keeping you up to date on today’s issues. Presents the surgical management of Parkinson’s Disease to help you determine when to recommend surgery and for which patients. Includes extensive comprehensive information on Parkinson’s so you can better diagnose and treat PD patients. Offers more clinical details on tremors, differentiating between PD and other movement disorders and the genetics of movement disorders so you can determine which movement disorder is present.